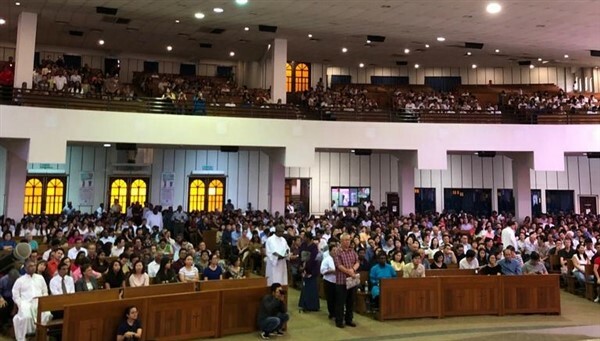 On the first Sunday of Lent, during the Sunset Mass (9 March 2019), we had a Rite of Sending for three of our catechumens. They were presented by their sponsors for enrolment in the Book of Elect. Before that, they were questioned about their preparations for the upcoming Easter Baptism. The Parish community and the sponsors gave their affirmation on the catechumen’s faithfulness in listening and responding to God’s Word. Then, they were called by name to sign the Book of Elect as a commitment of their readiness to receive the Easter sacraments. 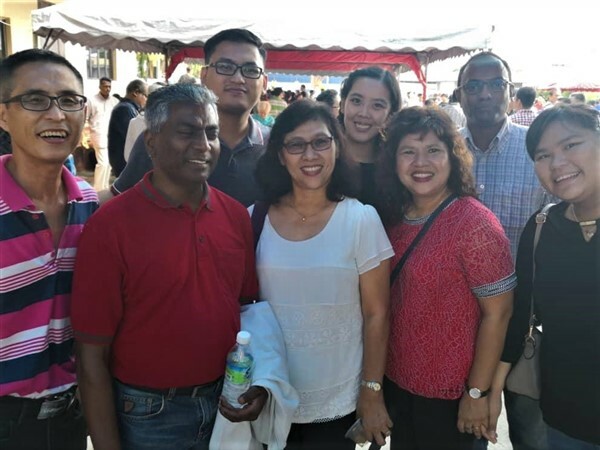 The following day, Sunday, 10 March 2019, the three catechumens were sent to the Church of the Holy Family in Kajang, to take part in the Rite of Election, accompanied by our Parish RCIA (Rites of Christian Initiation of Adults) team. 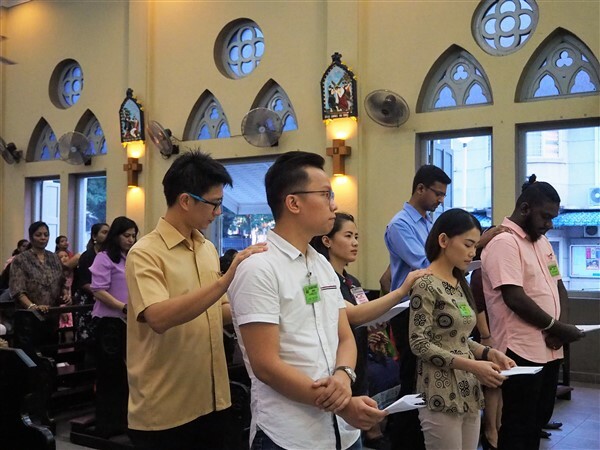 They gathered around Archbishop Julian Leow, along with 572 other catechumens from the Archdiocese of Kuala Lumpur. 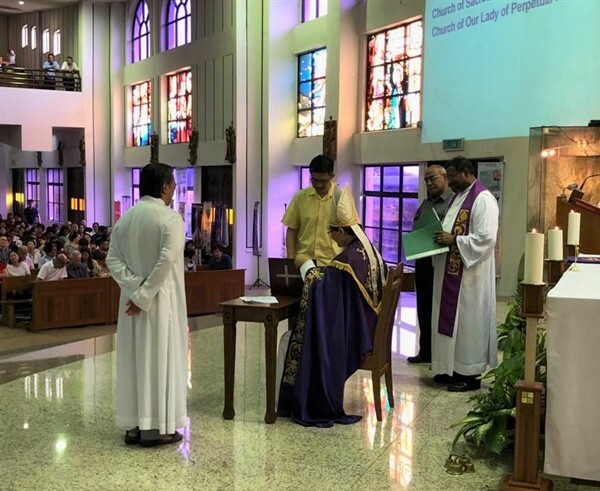 Each RCIA coordinator from the various parishes in Kuala Lumpur, accompanied by their respective priests, came forward to present the Book of the Elect to the Archbishop. Now, the catechumens are called “the Elect”. As the Elect make their final journey towards Easter, they have three more rites – also known as scrutinies – to fulfill. The Elect need to be uncovered and healed before they make the baptismal promises. During the First Scrutiny (3rd Sunday of Lent) there is the Presentation of the Creed and on the Third Scrutiny (5th Sunday of Lent) the Elect will be presented the Lord’s Prayer. Whereas, on the Second Scrutiny (4th Sunday of Lent) the Elect resolve and hold fast to Christ Jesus and promise to love God above all. These final rites of scrutinies and exorcism are celebrated in order “to deliver the elect from the power of sin and Satan, to protect them against temptation, and to give them strength in Christ” (RCIA #141). We engage the elect on a spiritual level, which in turn opens them up to the grace of God, who is at work in their lives, transforming them into the Body of Christ. In our Parish, we have total of 9 candidates who are going through the RCIA programme for the 2018/2019 session. Out of 9 candidates, six of them are preparing for the Sacraments of First Holy Communion and Confirmation. They will most likely be confirmed with our Form Five Catechism students in June 2019. It is sad to see the number of candidates for the RCIA program dwindling in our Parish. As parishioners, we hardly make the effort to introduce new faces into RCIA. Many of the candidates who have already received the Sacrament of Initiation in past years have not attended Mass regularly on Sundays. They went through the RCIA program but kept a distance from our Parish and Mass, after that. 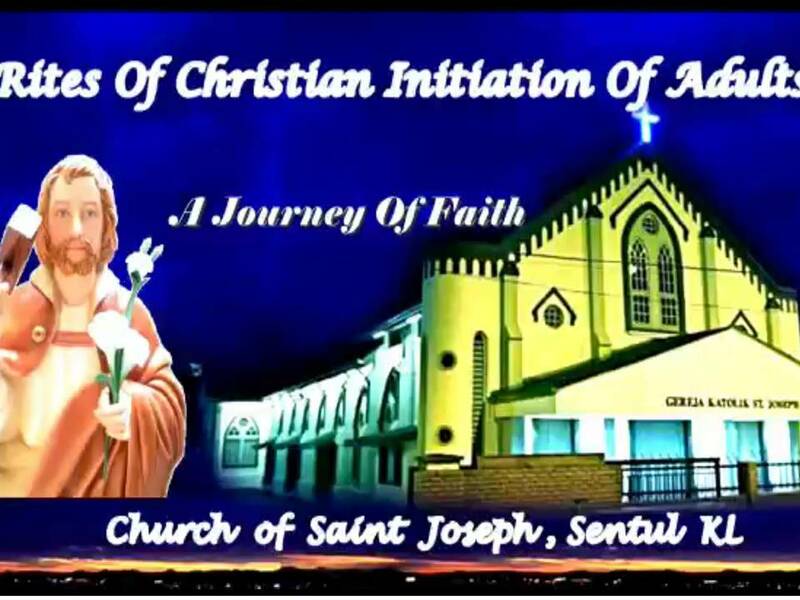 The PMEIA (Parish Ministry of Ecumenical and Interreligious Affair) together with the RCIA team, are planning to invite the recently baptised RCIA candidates for fellowship, interaction and dialogue, and we, as a parish community, wish to welcome them whole-heartedly. Once again I just want to remind you about our Parish’s vision for the years 2018-2020, which is “Committing Ourselves into New Evangelisation” and our mission for the year 2019 is to engage in dialogue and make friends with people of other faiths. This year, during the Extraordinary Mission Month of October, we should make a serious commitment in evangelising and bringing across the message of Christ into the lives of those whom we meet every day. The next RCIA session for the 2019/2020 will begin after Pentecost. It is our individual and Parish responsibility to invite more friends to join the RCIA program. God bless!